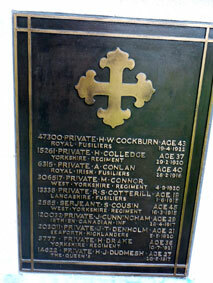 which includes the commemoration of two soldiers who served in the Yorkshire Regiment. 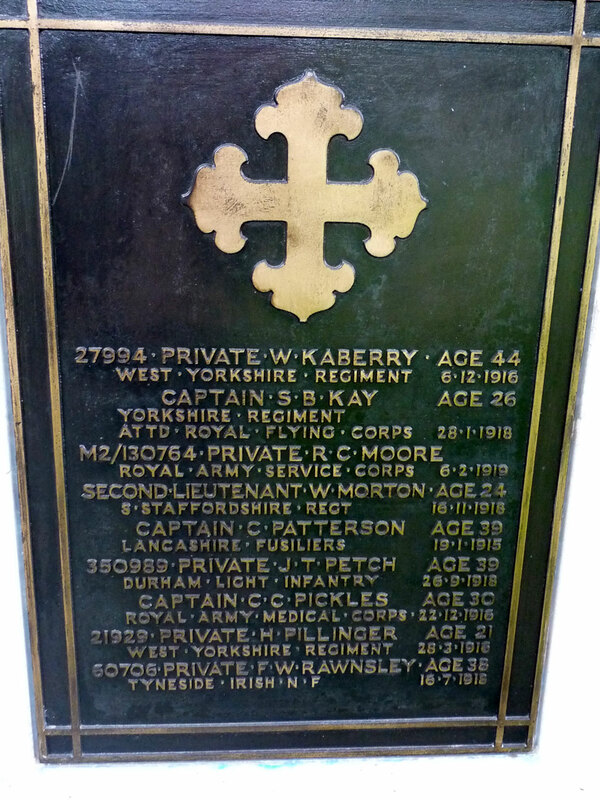 The information and photos for Leeds (Lawnswood) Cemetery, including the graves and commemorations of Yorkshire Regiment soldiers has been kindly provided by Andrea Hetherington (<ahetherington123@btinternet.com>), a Friend of Leeds Lawnswood Cemetery. We are extremely grateful to Andrea Hetherington for this information and the photos. Mike Berrell has additionally provided photos of individual plaques on the screen walls, and we are extremely grateful for his help. During the First World War, the major hospitals in Leeds were the 2nd Northern General with 1,800 beds and the East Leeds War Hospital with 1,900. Leeds was also one of the principal hospital centres in Yorkshire during the Second World War. 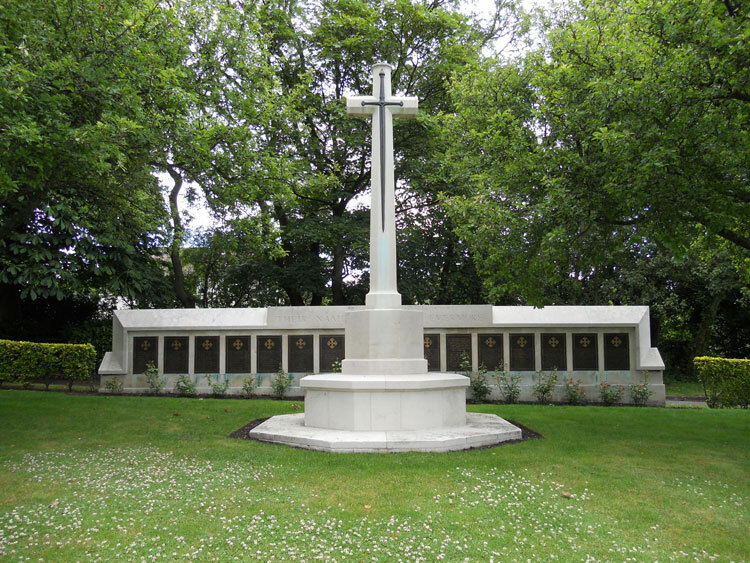 Leeds (Lawnswood) Cemetery contains 138 burial of the First World War, 88 of them forming a war graves plot in Section W. As these graves could not be marked individually, the names of the dead are recorded on a screen wall. The rest of the First World War burials and all of the 67 Second World War burials are scattered throughout the cemetery. 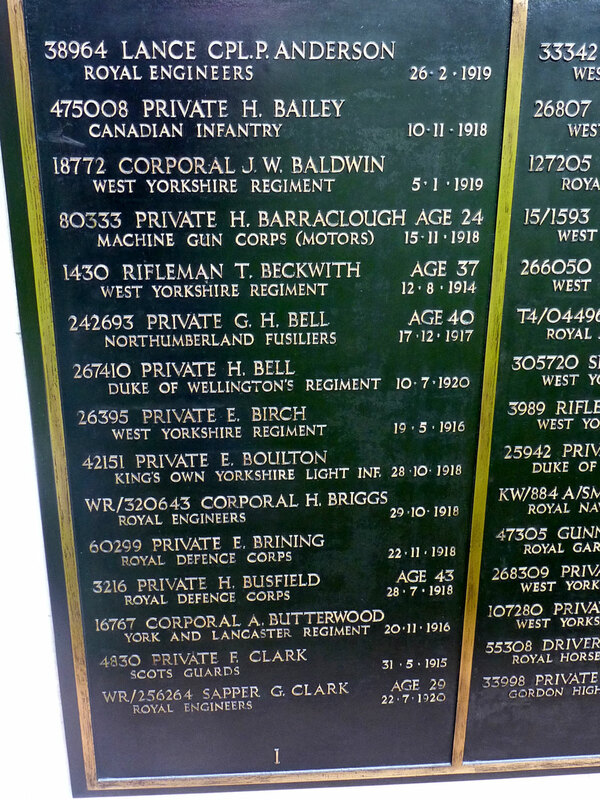 Four soldiers who served with the Yorkshire Regiment are commemorated on this screen wall, with one of the soldiers also having an identified grave (Private Waring). 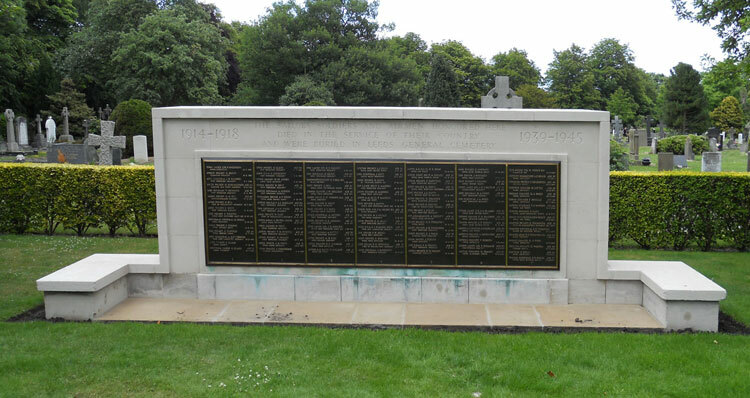 A further screen wall bears the names of 105 casualties of both wars buried in Leeds General Cemetery, where their graves could no longer be maintained. 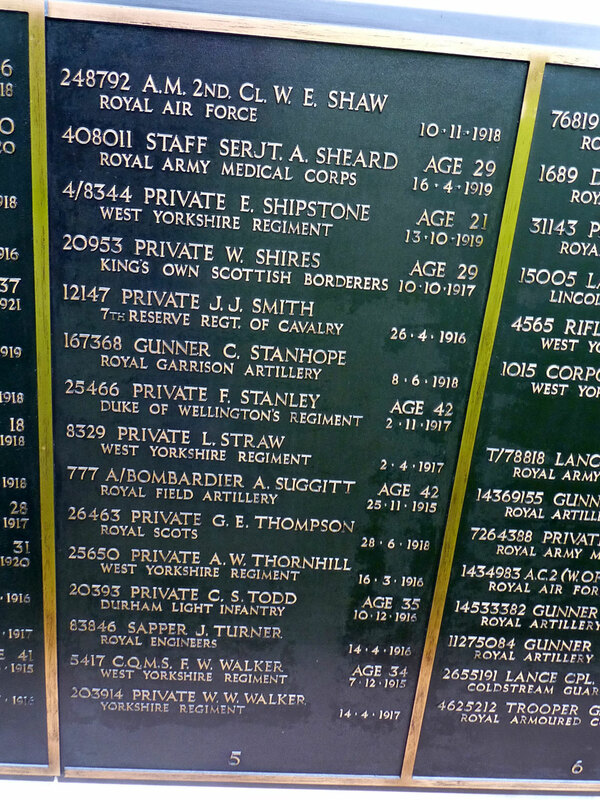 Two soldiers who served with the Yorkshire Regiment are commemorated on this screen wall. In addition to the above four soldiers of the Yorkshire Regiment, an officer who transferred to the Royal Flying Corps is buried in a family grave. This officer died in tragic circumstances, and further information on him, together with his photo, can be found by clicking on the link provided. The screen wall in Leeds (Lawnswood) Cemetery commemorating those who were buried in the Leeds General Cemetery. 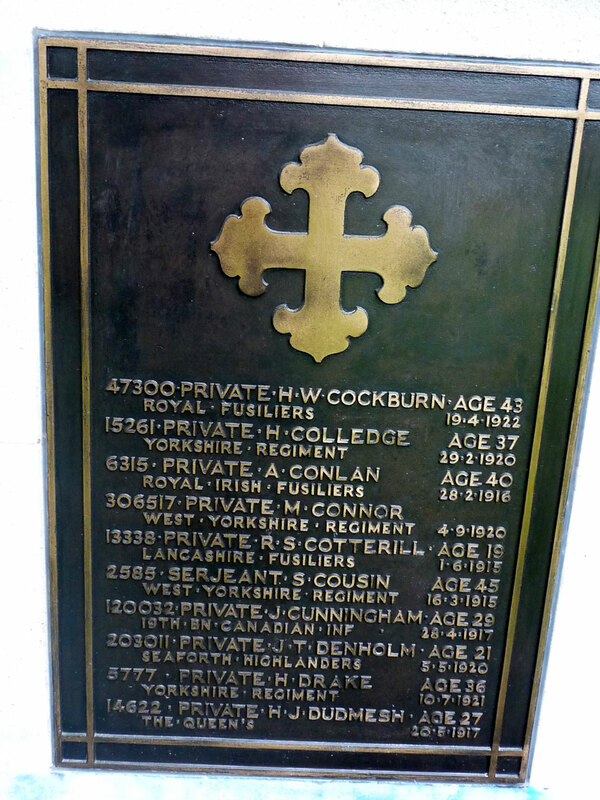 This includes the commemoration of one soldier who served in the Yorkshire Regiment. To view a larger sized image of the above, click on the thumbnail. Close the window that opens to return to this page. Machine Gun Corps (Motors), formerly 23855 Yorkshire Regiment. Son of the late John and Florence Barraclough, of Leeds. Alternative Commemoration - buried in Leeds (General) Cemetery. Died at home 15 November 1918. Aged 19. Commemorated on the Screen Wall for those buried in Leeds General Cemetery. The photo of the plaque on the screen wall is by Mike Berrell. Lance Corporal Isaiah Cleminson. 9808. 2nd Battalion the Yorkshire Regiment. Son of William and Catherine Cleminson, of 4, Pembroke St., Leeholme, Bishop Auckland, Co. Durham. Died at home 15 December 1914. Aged 24. Born Bishop Auckland, Enlisted Middlesbrough, Resided Bishop Auckland. 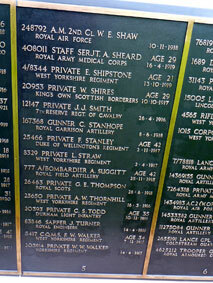 Commemorated on the main screen wall, - for detail see below. Husband of Florence Eva Colledge, of 6, Chastra St., Beeston Hill, Leeds. Died at home 29 February 1920. Aged 37. Commemorated on the main screen wall. 5th Battalion the Yorkshire Regiment, transferred to (446721) Labour Corps. Son of the late Francis Edward and Jane Drake, of Leeds; husband of Alice Drake, of 23, Greenhow Place, Burley, Leeds. Died at home 10 July 1921. Aged 36. To view a larger sized image of either of the above images, click on the thumbnail. Close the window that opens to return to this page. 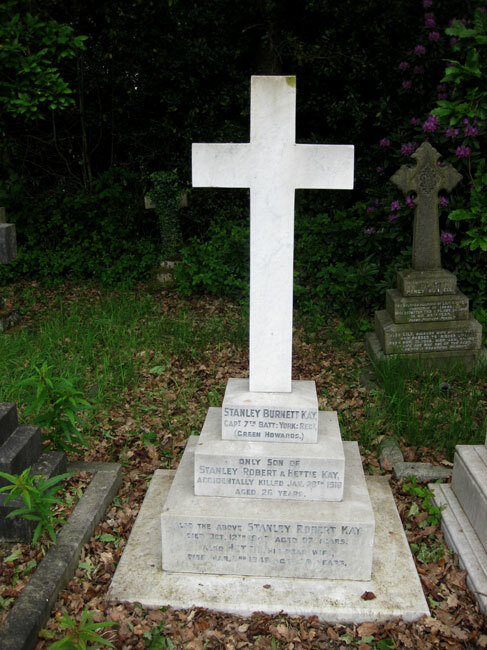 Captain Stanley Burnett Kay. RFC, formerly with 7th Battalion the Yorkshire Regiment. Son of Stanley Robert and Hetty Kay, of High Mead, Wood Lane, Headingley, Leeds. 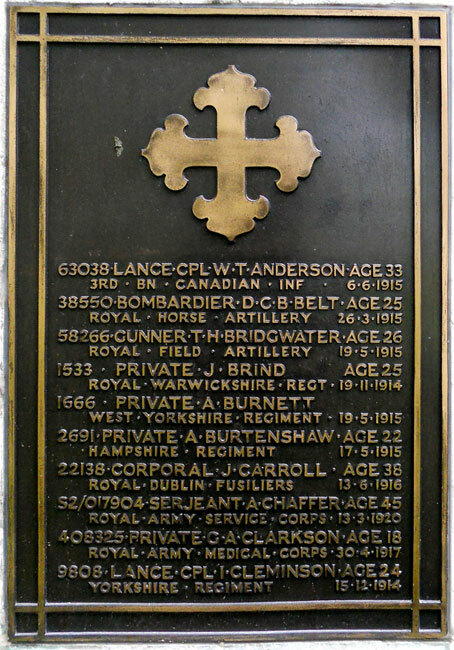 Killed 28 January 1918. Aged 26. 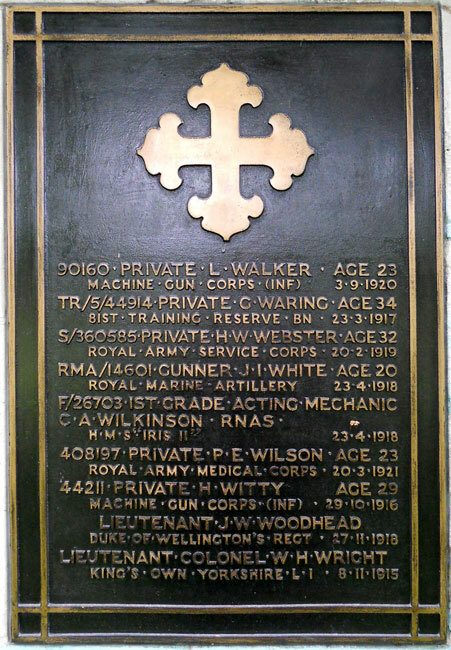 For a photo of Captain Kay, and further information on him, please see Photos - Individuals "K"
Private Walter Wilfred Walker. 203914. 4th Battalion the Yorkshire Regiment. Died at home 14 April 1917. 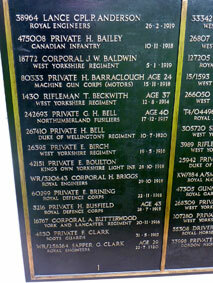 Born Hurworth (Yorks), Enlisted Leeds. Buried in Leeds (General) Cemetery. To view a larger sized image of the headstone, click on the thumbnail. Close the window that opens to return to this page. 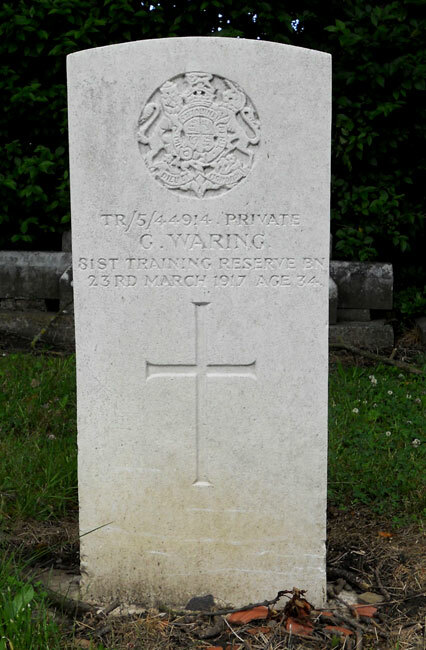 Private George Waring. TR/5/44914. 14th Battalion the Yorkshire Regiment, attached to 81stT R Battalion. Son of William and Jane Waring, late of Kirby, Moorside, Yorks; husband of Emily Waring, of 49, Thornville Rd., Burley, Leeds. Died 23 March 1917. Aged 34. 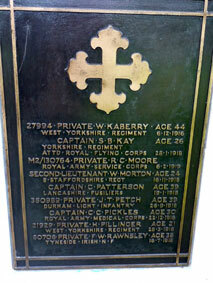 Born Kirbymoorside (Yorks), Enlisted York, Resided Sheriff Hutton (Yorks). The screen wall commemoration of Private Waring.